On Wednesday, Canada became the second country in the world to legalize marijuana. Canadian cannabis companies have already struck multibillion-dollar partnerships and joined major U.S. stock indexes, while marijuana remains illegal at the federal level in the U.S. Some business owners in the U.S. cannabis industry say America must either catch up quickly or be left behind. Cannabis plants grow at the CannTrust Holdings Inc. production facility in Fenwick, Ontario, Canada, on Monday, Oct. 15, 2018. A full-page advertisement in Tuesday's print edition of The Wall Street Journal sounded a siren of alarm to an audience of one. "Dear Mr. President, We need your help!" the open letter to President Donald Trump began. "Canada is threatening to deprive American farmers, workers and businesses from the prosperity that rightly belongs within our borders." That language could have applied to the U.S. and Canada's recent tug of war over the details of an updated trade pact. 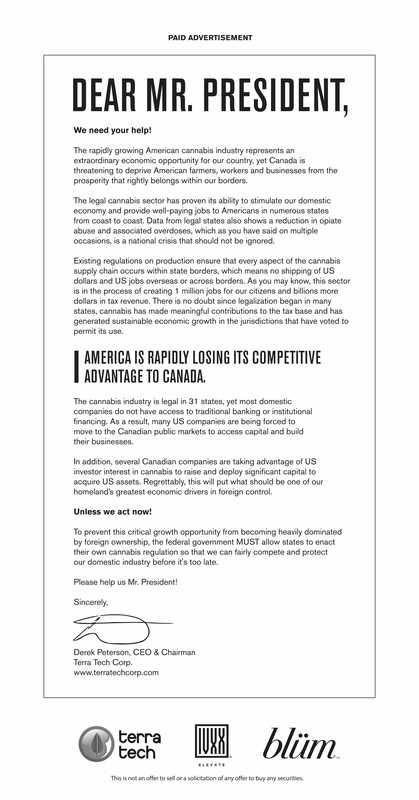 But CEO Derek Peterson, who authored the ad, was warning Trump of a different threat entirely: Canada's burgeoning pot market. Derek Peterson, chief executive officer of Terra Tech Corp., speaks during the Cannabis World Congress & Business Expo in Los Angeles, California, U.S., on Thursday, Sept. 14, 2017. On Wednesday, Canada became the second country in the world to legalize marijuana, the fulfillment of a promise made by Prime Minister Justin Trudeau in 2015. But in the run-up to Oct. 17, Canadian cannabis companies have already struck multibillion-dollar partnerships and joined major U.S. stock indexes, while marijuana remains illegal at the federal level in the U.S. Entrepreneurs like Peterson, whose company Terra Tech operates six stores in California and Nevada, say America must either catch up quick — or let its nascent cannabis market wither. "If we wait two years, we're going to be way behind the eight ball here," he told CNBC in an interview. Peterson, a Wall Street alumnus, told CNBC that he wants to veer the conversation toward capital markets. "I think we've all done enough to start that national discussion around the legitimacy of the industry," he said. Peterson frames his company's ad in the Journal as an appeal to a president with a heavy media diet and a mind for business. "Part of it is trying to bend the president's ear. We know he pays attention to the mass media," said Peterson, whose other plans include advertising during "Fox & Friends," the Fox News morning show Trump is known to watch. "But the other side of it is to make sure that we bring a level of consciousness to what's going on out there from an economic and capital markets perspective," he added. The urgent push to end prohibition for the economy's sake has its critics who worry about drug abuse. "The industry absolutely wants to speed up, because they want to collect as much money in a short amount of time as possible," said Kevin Sabet, director of the University of Florida's Drug Policy Institute. "We are in the midst of an opiate and addiction crisis right now and the idea that we would want to let addiction industries thrive and prosper makes no sense," he said, adding that today's marijuana is much stronger than the "Woodstock weed" of decades past. Peterson's open letter spends little time extolling the health benefits of cannabis, but alludes to a handful of studies suggesting that opioid use has declined in states that legalized marijuana. Terra Tech trades publicly on the OTCQX market, and Peterson says his business has grown exponentially since its founding in 2010 as the U.S. market expands even under prohibition. "There's been a significant paradigm shift around the industry," he said. Yet federal marijuana criminalization prohibits American cannabis companies from listing on the New York Stock Exchange and the other Wall Street indexes. Instead, many of these U.S. companies have sought to expand on stock markets in Canada. Canadian cannabis companies, however, can earn a slot on major U.S. exchanges because they are not subject to the federal ban — and some have been making the most of that access. Ontario-based medical marijuana producer Canopy Growth, for instance, recently struck a deal worth $4 billion at the time with Corona and Modelo maker Constellation Brands. The beverage giant now holds a 38 percent stake in Canopy, which is listed on the NYSE. Other Canadian pot stocks, such as Tilray and Cronos Group, trade on the Nasdaq. What's more, Canadian companies with more money to invest have made inroads in U.S. capital acquisitions. Earlier this week, Canopy sent pot stocks higher after it announced a deal to buy Colorado-based hemp company ebbu for 25 million Canadian dollars ($19 million) in cash. "The problem that we're under right now is partially growth, but partially who ends up owning all the pieces," Peterson said, adding that he is concerned about allowing the U.S. cannabis market to "end up in the control of foreign conglomerates." Peterson said the ad cost $100,000 to run in the Journal's eastern region print edition, an area that encompasses about 20 states with an estimated daily circulation of nearly half a million papers. A spokesman for the newspaper declined comment, but referred CNBC to an advertising rate sheet that suggests a full page ad in black and white costs about $126,000. Politicians of both major parties, who for decades treated cannabis advocacy as taboo, have warmed to marijuana. But even in recent administrations, the clash between state and federal marijuana statutes has flared up. The administrations of both Barack Obama and George W. Bush, for instance, oversaw numerous raids on pot producers, even in states where their operations had been legalized. After decades of prohibition, California in 1996 became the first U.S. state to legalize cannabis for medical use. But by 2018, medical marijuana had been legalized in 30 states, and nine allow recreational pot use. Public support for marijuana has grown markedly in recent years. In a 2017 Gallup poll, a record-high 64 percent of Americans said they supported marijuana legalization. "Lawmakers, while often slow to respond to public demand, are increasingly realizing the untenable position of maintaining a pro-criminalization stance," said Justin Strekal, political director for the National Organization for the Reform of Marijuana Laws, or NORML. "As public support continues to grow, that is going to create a virtuous cycle of policy changes upwards," Strekal said. "Our biggest opponent right now is apathy and entrenched reefer madness ideology." So far, the Trump administration has sent mixed signals but it appears to be adopting a more liberal view on medical marijuana. Attorney General Jeff Sessions' Justice Department in January rescinded a policy directing federal prosecutors not to target marijuana businesses that conducted themselves within state law. But in April, Trump ditched Sessions' stance following an appeal by Republican Sen. Cory Gardner of Colorado, who had vowed to block DOJ nominations in retaliation. Sessions was given no advance warning of the shift, news outlets reported. Last week, staunch Trump ally Rep. Dana Rohrabacher, R-Calif., told Fox Business News that he has "been reassured that the president intends on keeping his campaign promise" to legalize medical marijuana across the country. Meanwhile, lawmakers have introduced sweeping legislation to defang the ongoing federal prohibition. Sen. Cory Booker, D-N.J., and Rep. Barbara Lee, D-Calif., have proffered bills that would not only decriminalize marijuana but nullify some possession-related convictions and establish community funds. Senate Minority Leader Chuck Schumer, D-N.Y., introduced his own legislation that has been co-sponsored by nine other senators. While Democrats in Congress still tend to be more outwardly supportive of marijuana decriminalization policies than Republicans, the gap appears to be narrowing. Gardner, alongside Sen. Elizabeth Warren, D-Mass., in June released a bipartisan bill prioritizing states' rights on marijuana. Rohrabacher helped introduced an amendment to an omnibus spending bill that protected medical marijuana recipients and became law in 2014. And GOP Rep. Thomas Garrett of Virginia pushed a bill that would effectively end marijuana prohibition at the federal level. Many advocates and critics of a more liberal pot policy view the push for medical marijuana as a stepping stone toward the model adopted Wednesday by Canada. Under that system, a plethora of cannabis products containing the psychoactive ingredient tetrahydrocannabinol will be legal to buy, sell, distribute and consume recreationally. As Canada legalizes, pot industry activists and business owners have their eyes set squarely on U.S. prohibition. "That's literally it," Peterson said when asked what was the biggest threat to his business. For Sabet, however, prohibition is a bulwark against the drawbacks of an unfettered marijuana industry. "I'm not surprised that the industry is saying that they don't want to be missing out from Canada," Sabet said, "but frankly I think it's a good thing that they are missing out."